Back in April, the admins of the infamous "Jews" page on Facebook tried to find out what they could do in order to bring back administrative rights to the page that they, and many others like ourselves, helped to build up to over a quarter of a million fans of the span of many years. If a page lacks admin rights, it means it can no longer publish updates. It essentially destroys a page's ability to function. We even launched a major campaign to try to get the page back. Since then, Facebook even removed the original URL to the page. It used to be facebook.com/thejews. Now some Israeli band has that URL somehow. 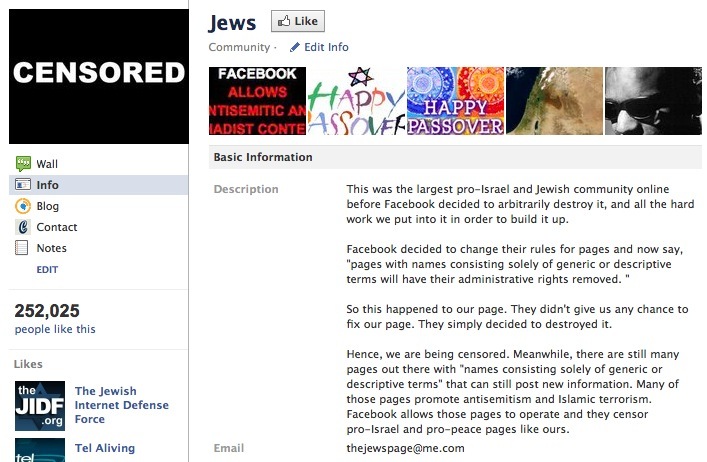 Facebook just arbitrarily took it from the admins of the original "Jews" page and gave it to someone else. This was the largest pro-Israel and Jewish community online before Facebook decided to arbitrarily destroy it, and all the hard work we put into it in order to build it up. Facebook decided to change their rules for pages and now say, "pages with names consisting solely of generic or descriptive terms will have their administrative rights removed. " So this happened to our page. They didn't give us any chance to fix our page. 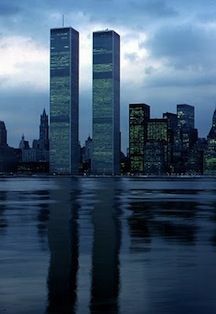 They simply decided to destroyed it. Hence, we are being censored. Meanwhile, there are still many pages out there with "names consisting solely of generic or descriptive terms" that can still post new information. Many of those pages promote antisemitism and Islamic terrorism. Facebook allows those pages to operate and they censor pro-Israel and pro-peace pages like ours.